Description: Our 'We are moving' card printing service gives you A6 'We are moving' cards printed in full colour on the outside and black on the inside. The 'We are moving' cards are finished with a gloss laminate to the picture side. The reverse is uncoated and easy to write on. Our 'We are moving' cards are printed in full colour on both sides on eco-friendly paper from sustainable sources. If you need your moving announcement printing sooner, contact us to discuss a quicker delivery time. What can printed 'We are moving' Cards do for me? Our 'We are moving' cards are the perfect way to let all the important people in your life know about your change of address. From friends to family, your dentist to your dog walker, our 'we are moving' cards will let you tell your news in style. And instead of taking your precious time to call each person one by one, moving announcements let you tell everyone you know in a more convenient way. 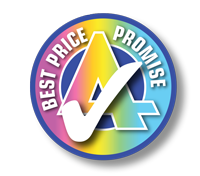 Azimuth Print, the UK's premier card printer offers a cost-effective, high-quality 'We are moving' card printing service. We can print moving announcements in A6 (148 x 105 mm) size. 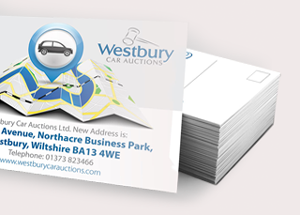 Our 'We are moving' cards are printed on 300gsm Trucard. They are finished with a gloss laminate to the picture side. The reverse is uncoated and easy to write on. Other sizes and run lengths also available on request. You can either send us your own artwork or commission our designers to come up with a great look for your printed moving announcements for an extra charge. If you need to make small changes to your copy and design, we can take care of these at no extra cost, while larger amendments to your 'We are moving' card can also be made for a fee. To find out more about the UK's premier card printer, just get in touch for a quote or for answers to any questions you might have about our card printing services.